Pollen is a non-profit that breaks down barriers by creating a space for communities to be better connected. Its established community of users, from local artists to C-Suite executives, craves the ability to interact with one another and share their voices online. 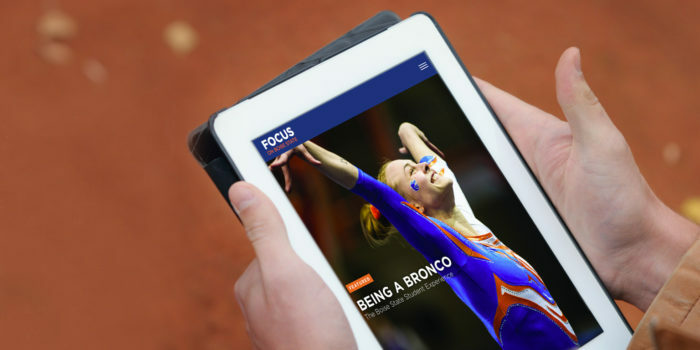 With a renewed focus on producing visually stunning long-format editorial content and user-sourced job opportunities and events, the organization needed a website that better supported those efforts. When we first sat down with Pollen, we knew that close collaboration was going to be an essential element to success. The co-directors had big ideas and the power to make bold decisions. 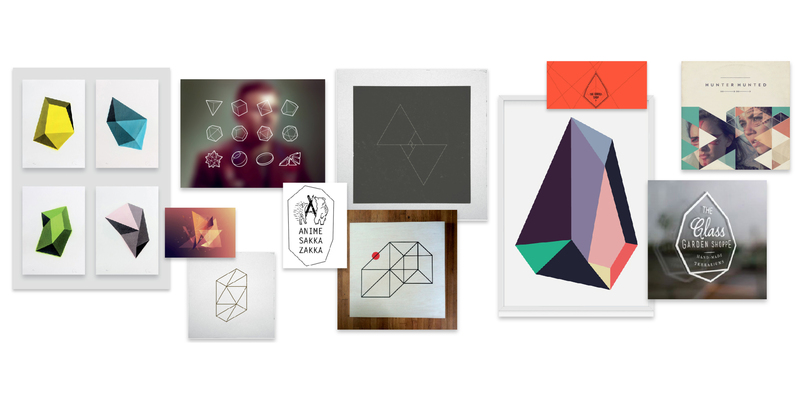 Pollen’s existing website didn’t accurately represent the organization’s identity. The editorial content wasn’t visually engaging and their process for publishing user-sourced opportunities was cumbersome and inflexible. 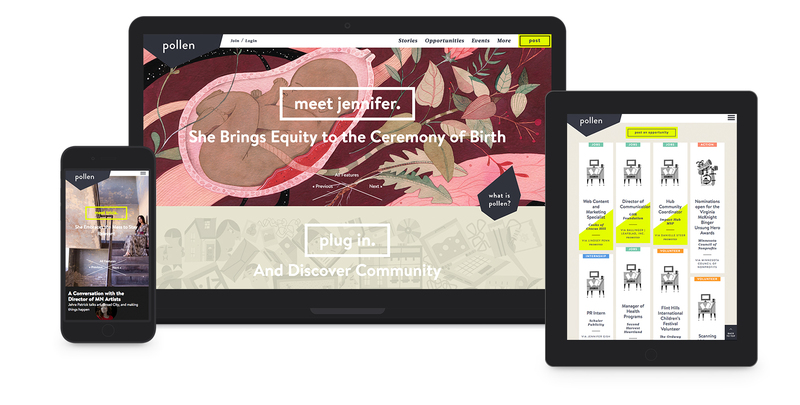 The Pollen team wanted a publishing powerhouse that could showcase gorgeous editorial content while still being accessible on mobile and tablet devices. As the co-executive directors put it, they wanted a “content rocket ship,” and it had to be built on a platform that wouldn’t take a rocket scientist (aka a developer) to figure out. 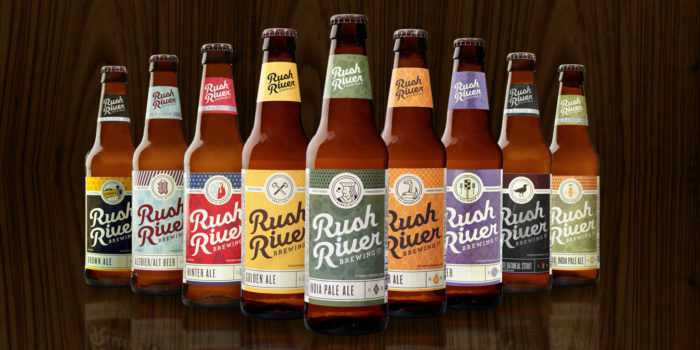 Over the course of three months of consulting, we dug in deep and established a true partnership. We worked with Pollen to solidify its business plan and establish short and long-term goals. Leveraging Pollen’s abstract ideas and business objectives, we effectively created a strategic roadmap that could set them up for future success. One of our first discovery sessions centered around evaluating the existing Opportunities page (the most popular section among its visitors), where users share employment opportunities and events. We worked with Pollen to identify strengths and weaknesses, and ultimately craft a more robust, long-term solution. Working closely with the Pollen team, we created a revitalized brand that better captures the organization’s spirit of being bold, inspiring and engaging. Once the essential elements had been established, we demonstrated how the brand could be carried throughout the new site, and helped guide Pollen in consistently communicating their brand both digitally and in print. Eye-popping design is a vital component of Pollen’s identity, and one of the features that sets their content apart from their competitors. Working closely with the organization, our team came up with a solution that allows Pollen’s editors to lay out long-form editorial content in a traditional print magazine style, seamlessly integrating photography, gifs, animations, illustrations and text. A bold new design on the front-end and a custom dashboard on the backend allows Pollen’s team to give each story its own distinct identity. To better leverage the Opportunities section – where users share employment openings and events, among other things – we took a direction that mirrors the familiar layout, functionality and simplicity of Pinterest. The design of the quick-and-easy submission form helps encourage membership, further expanding the Pollen network. We created a customized long-form content builder within WordPress just for Pollen. Their team can now create gorgeously complex, magazine-style layouts, with the flexibility to swap out entire CSS style sheets (typography, color palettes, text size, hover effects, images, etc.) in a few clicks. The content is also easily consumable on mobile and tablet devices, with options to swap out how the content is presented on smaller screens. The revamped Opportunities section we developed significantly streamlines the submission process for both users and the Pollen team. Pollenites can now quickly submit content directly through the website, the Pollen team can review it at their convenience, edit where necessary and publish immediately. Additionally, users can now submit paid featured posts, creating a new revenue stream for the non-profit. publications, but on a non-profit budget. The impact has been wide-reaching. Pollen’s membership has shot up, views of its content are soaring and the organization is on track to reduce its reliance on grants and continue empowering communities through a more sustainable publishing model. 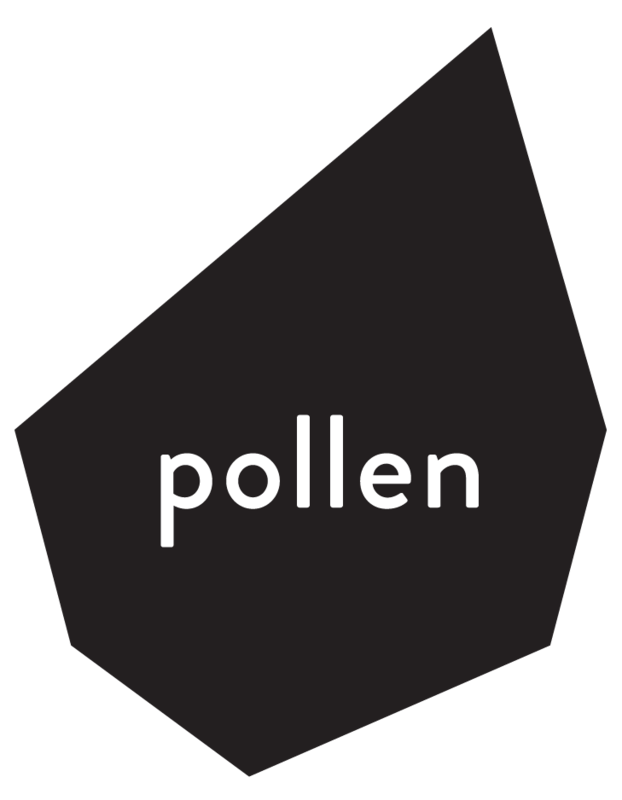 Pollen can now spotlight its beautiful, inspired editorial content of photography, gifs, animations, illustrations and text. The content is also easily consumable on mobile and tablet devices, with options to swap content presentation on smaller screens. 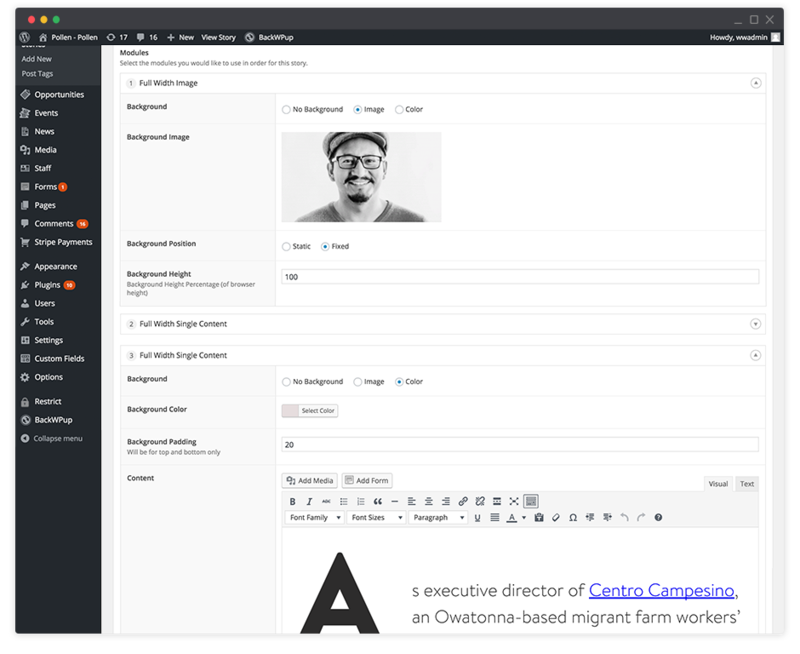 From full-width and columns to image overlays and backgrounds, the long-form content builder has it all. The non-profit’s content editing abilities now rivals those publications with million dollar web budgets.